Justin Bieber turned away from the Heat game after arrest? 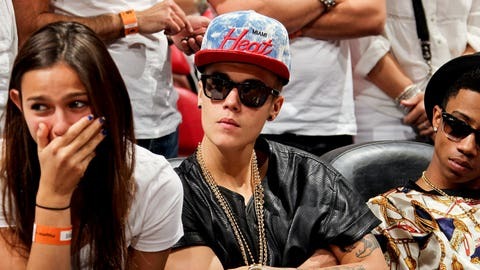 Did Justin Bieber get banned by the Heat? The Miami Heat withdrew Justin Bieber’s tickets to the the team’s matchup with the Lakers this week after the 19-year-old pop star was arrested by Miami Beach police, according to a report from E! News. It was reported that after Bieber got released from jail following his DUI charge on Thursday, he was supposed to be sitting courtside at American Airlines Arena. But the pop singer was a no-show at the game. According to a source, the Heat pulled his tickets at the last minute because the type of attention he was expected to attract after getting pulled over in a Lamborghini, reportedly cursing out the cops and being charged with driving under the influence, resisting arrest (nonviolently) and driving with an expired license. It’s the not the first time the team has taken on a pop star in the headlines. Last year Lil Wayne tweeted that the Heat kicked him out for rooting for the Lakers, though the team denied it.